The Daring Bakers: Sans Rival and Bibingka ~ I Can Do That! Thank you Catherine for sharing with the Daring Bakers two of our Filipino cakes. They are my personal favorites and I have been baking them for many years now because these are not commercially available in my neck of the woods. The recipes provided by Catherine are here. For this challenge I didn't follow the recipes for both Sans Rival and Bibingka. I used the Sans Rival recipe from my Filipino cookbook and the bibingka from a combination of various recipes that only have regular rice flour. Preheat oven to 350°F.Beat the egg whites until stiff. Add the sugar gradually, continue beating. 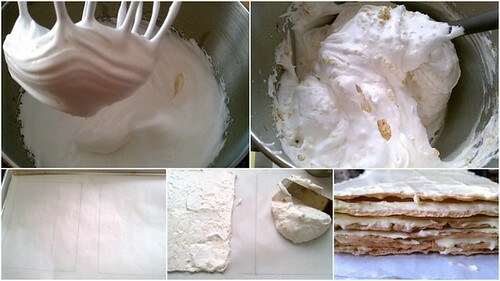 Fold in nuts and vanilla. Divide mixture into five and spread on five parchment-lined 9-inch round pans or 9-inch rounds drawn on parchment paper (flip paper so the pencil marks are facing sheet pan). Bake in a 350°F oven until golden brown, about 12 to 15 minutes depending on thickness. Turn off oven, leave in the oven for 2 hours or longer until layers are dry to the touch and very crispy. Boil water and sugar until it spins a thread, 225°F on candy thermometer. In the bowl of a standing mixer with the paddle attachment, beat egg yolks until very thick and pale yellow in color, about 6 minutes. Pour the hot syrup gradually over egg yolks and continue beating until mixture has thickened. Transfer to a bowl and chill in the fridge for an hour. In the same bowl, cream butter then add the well chilled egg mixture. Beat on medium high speed until buttercream is light and creamy. Spread a very thin layer of buttercream on smooth side of one meringue round, place on a parchment-lined plate, place another meringue on top; repeat until you have spread the filling and stacked all the meringue rounds. Fill the gaps, sides, and top with buttercream. Sprinkle sides (and top, if desired) with chopped nuts. Refrigerate overnight before cutting into slices. Or leave in the freezer for 2 hours before slicing. 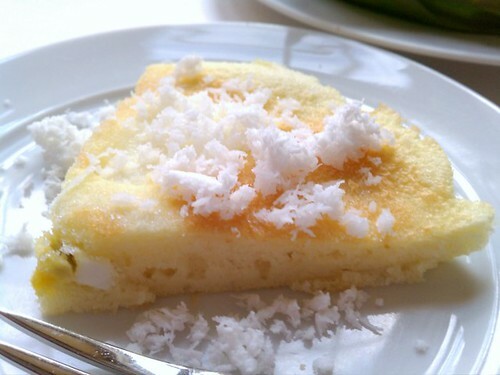 Baked Bibingka is just one of the many forms of bibingka we have in the Philippines. 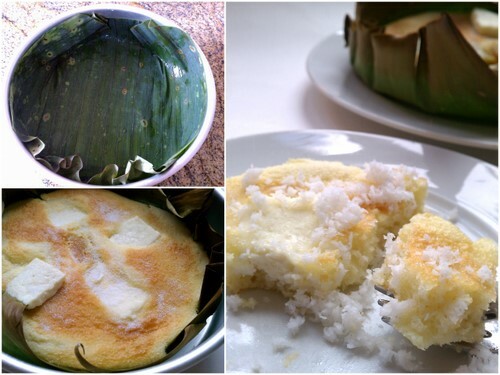 Bibingka are flat cakes that can be made with regular whole rice or rice flour, whole glutinous or glutinous rice flour, pounded young immature greenish glutinous rice called pinipig, and grated fresh cassava. 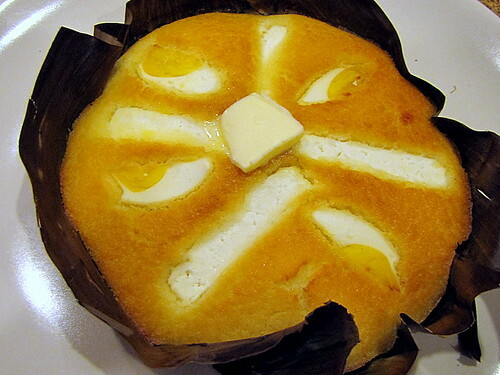 Bibingka are either baked or steamed; some are pre-cooked then topped with coconut jam before baking. 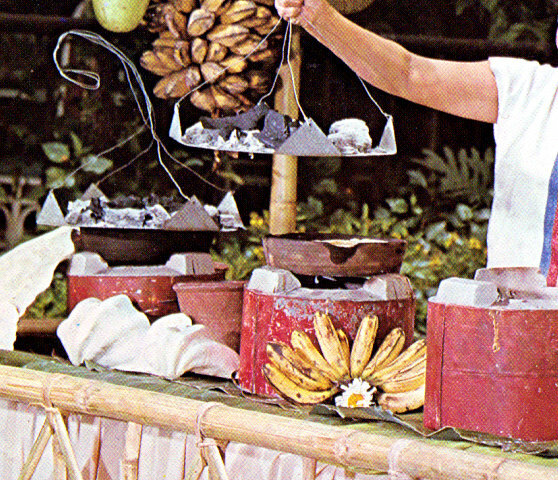 The bibingka chosen for this challenge are traditionally baked in round clay dishes lined with wilted banana leaves set over individual clay bakers filled with hot coals. A piece of galvanized iron fitted with a wire handle is filled with more hot coals and placed on top of the dish with the batter. The bibingka is baked quickly with equal heat coming from below and above. These gluten-free cakes should be very soft, airy, and fluffy just like a cake made with wheat flour and they shouldn't have a hint of stickiness at all. To mimic the heat from below and above method, I bake bibingka in a toaster oven at a very high setting. If you have one I recommend using it rather than the regular size oven. Preheat toaster oven to 425°F. Line three 8-inch round pans with banana leaves. In a medium bowl, mix all the rice cake ingredients except cheese and salted duck egg, until well incorporated. Batter should be slightly loose; add more milk or water to adjust consistency. Pour 1/3 of the batter in the first prepared pan, arrange white cheese and salted egg on top; bake for 12 to 14 minutes until top is golden brown. Remove from oven; spread some butter and sprinkle sugar on top. Fill the next pan and bake, repeating for the third and last time. Slice into wedges and top with desired amount of grated coconut. Traditional Filipino salted duck eggs have no other ingredients but sea salt mixed with clay or mud and the eggs are cured from 15 to 30 days. The eggs when fully salted and boiled have very oily and bright orange yolks and the whites are firm but not rock hard. In the Philippines the salted egg shells are colored with red vegetable dye to distinguish them from unsalted ones. I salt duck egg using the brine method with boiled filtered water cooled to lukewarm before mixing in the sea salt. We love them served with diced or sliced tomatoes as a side dish or salad. Chicken eggs are not suitable for salting because their whites are more watery and don't have the viscosity of duck egg whites. In a large bowl, dissolve 1¾ cups salt in water. Add enough salt until they don't dissolve anymore. Scrub and clean duck eggs with soap and water, rinse very well, and place in the container. Gently place the bag of water on top of eggs. Lift one corner a bit and slowly pour the salted water over the eggs making sure they are submerged completely. Cover and leave undisturbed for 30 days. Rinse eggs with water and boil for 15 to 18 minutes. Drain and immediately rinse under cold water. Keep salted eggs in refrigerator until ready to use. I hope you don't mind the long post. I'm just very happy and excited for the opportunity to write about our Filipino native cakes and desserts and to share with you, my fellow Daring Bakers and all my readers. Just in time for Xmas cooking Oggi! I will definitely try at least one of this recipe this coming December! What a gorgeous array of desserts, Oggi! It all looks scrumptious. Perfect recipe for Christmas, Oggi. Your Sans Rival and Bibingka look very delicious. I can only imagine the aroma of the bibingka being baked. Yumm! Have a great week, Oggi. Oggi, I want to give you some extra thanks on this challege - when it was announced, I searched online and found your earlier post on this, and I used your recipe in making my own Sans Rival! I linked back to you, too, in my post :) That said, you did an amazing job repeating these recipes here for the challenge. Excellent work!! Wow! You did a great job on this challenge. I really wanted to try the bibingka, but I did not have time. I love your salted egg salad with tomatoes. You really went all-out this month! I bet it all tasted fantastic. And I have to say THANK YOU for your other sans rival post - I found it really useful when I made this month's challenge! Beautifully done sans rival! Love all the kinds of bibingka you made...especially the Bibingkang kanin...that's the best! Excellent job! Yumm!!! That Sans Rival cake looks so pretty! Perfect layers & frosting! I love your Sans Rival...very elegant!! I so mad at myself for missing this one. Great job like always. Since I have traveled in the mountains of the Philippines, I got to have this dessert many times in Baguio. I came home and made this 2 Christmas's ago. The only thing different, was that my recipe called for 12 egg whites!! Maybe it is a bigger cake? My merangue may have been thicker, tho I remember it was only like 1/2" or less. I used almonds. Delicious! 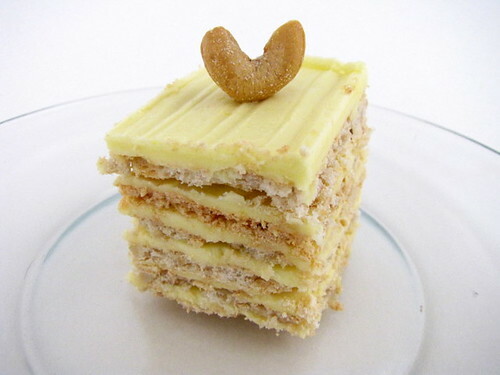 Can I substitute Splenda for regular sugar when making Sansrival? I tried Stevia but it had that bitter aftertaste to it. 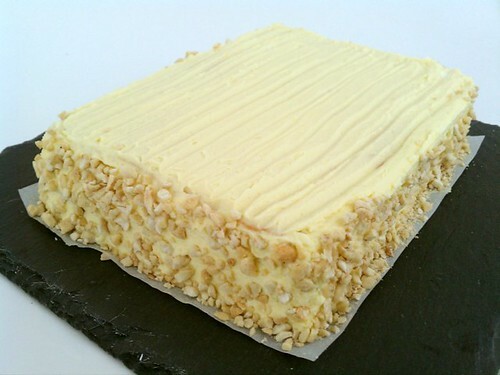 I have never tried using any type of sugar substitute for baking meringue type cakes. I honestly can't recommend them. Thank you, Oggi! I will try it and see how it turns out! can i use whisk attachment instead of a paddle attachment?thnks! Anonymous, yes I suppose you can use whisk for both meringue and buttercream filling.